Take Ten: Martin Luther King, Jr. The Autobiography of Martin Luther King, Jr. – Martin Luther King, Jr. Drawing on King’s unpublished writings and other materials, a civil rights scholar assembles a first-person narrative of King’s life. Unique portrait of the civil-rights struggle and how it shaped one of the country’s foremost revolutionaries. Martin Luther King Jr.’s transformation into the voice of America’s moral conscience would not have been possible without the influence of the grassroots warriors he met in Montgomery. A thrilling, behind-the-scenes account of the weeks leading up to the great event, as told by Clarence Jones, co-writer of the speech and close confidant to King. 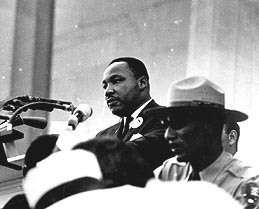 An unlikely alliance of former student radicals, the middle-aged patrician mayor, the no-nonsense police chief, black ministers, white churchgoers, Atlanta’s business leaders, King’s grieving family members, and his stunned SCLC colleagues worked to keep Atlanta safe, honor a murdered hero, and host the tens of thousands who came to pay tribute. Provides an in-depth history of the final crusade of Martin Luther King, Jr., against the economic injustices, racism, and lack of political power that marked 1968 Memphis and transformed the city into a struggle between the white upper crust that sought to prevent change and the black workers, activists, unionists, and black-power advocates that sought to bring about equality. Presents an account of the creation of King’s famous “Letter from Birmingham Jail” and the related protest march on Washington, offering insight into its timeless message and crucial position in the history of human rights. From the acclaimed bestselling author of “Ghost Soldiers” and “Blood and Thunder,” a taut, intense narrative about the assassination of Martin Luther King, Jr., and the largest manhunt in American history–a sixty-five-day search that led investigators to Canada, Portugal, and England. The Poor People’s Campaign, designed by King in 1967 and carried out after his death, brought together impoverished Americans of all races to demand better wages, better jobs, better homes, and better education. He believed that not only a fight for rights but the radical distribution of wealth had to be demanded through interracial protest. Focuses on Martin Luther King, Jr., and the key moments that defined his rise to the forefront of the civil rights movement in America, from Rosa Parks’ arrest in Montgomery to King’s imprisonment in Birmingham and his triumphant march on Washington. Also read: Pillar of Fire: America in the King Years, 1963-65 and At Canaan’s Edge: America in the King Years, 1965-68. A compilation of Dr. King’s most significant speeches and writings. Annotations provided by NoveList Plus. Log in to NoveList Plus for more reader information.